help make arrangements for event starts. WRAPUP: Thrills, chills and speed!! Everyone had a fabulous time at this years event. The racing was close and mostly clean, and what wasn’t clean makes for fun bench racing stories. The format was a little different, with two person teams and 45 minutes of time, but it actually allowed for a bit of additional racing time, and it is always fun racing on the full size combined track. If you have any photos or video of the event, please send the link (not the actual pictures) to steve@chicagominiclub.com and I will link them here. Looking for a bit of MINI baking fun this season? MotoringChix is producing durable handmade MINI cookie cutters, in both Cooper and Clubman styles. Check out this blog entry at MotoringChix.com for pricing and ordering information. 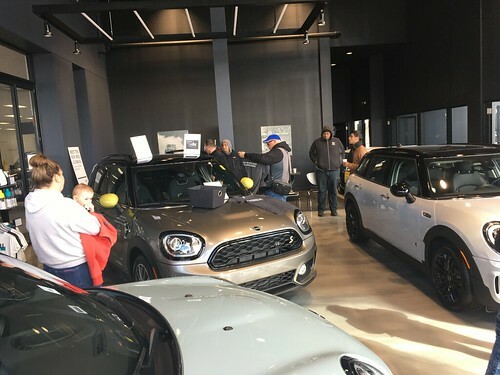 Johnna from MotoringChix is even offering the Chicago MINI Motoring Club a 15% discount!! Add a comment and share a link to your decorated MINI cookies here.